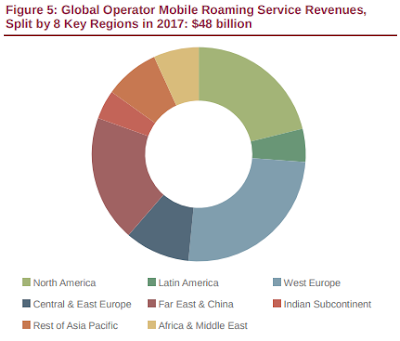 25 July 2017, 16:04 p.m.
Telecom network operator revenues from international mobile roaming are expected to experience an 11 percent decline in 2017, as service providers introduce ‘Roam Like at Home’ packages in key markets - including Europe, North America and Asia-Pacific. ‘Roam Like at Home’ enables mobile users to utilise their monthly voice, data, and messaging allowance while roaming on other service provider networks, without incurring additional charges. Juniper Research forecasts that the annual revenues, worth an estimated $54 billion in 2016, will decline to $48 billion in 2017 as revenues generated from increased usage in many markets fail to offset those lost by lower roaming charges in the EU countries. "This decline in global revenues is due to a 33 percent fall in European roaming revenues, following the EU regulation to end roaming surcharges," said Nitin Bhas, head of research at Juniper Research. While they expect roaming tariffs outside Europe to continue to be unregulated and to be significantly higher, operator focus will need to shift to innovative bundles and tailored pricing to preserve or grow revenues from travelers and immigrant workers. The research found that mobile network operator revenues will likely begin to recover in 2018, following a significant increase in active roamers and data usage. Following Britain’s decision to leave the EU, it is possible that UK mobile network operators may try to make up for the loss by increasing domestic service prices, especially since their margins have been falling at the rate of 1-2 percent over the last 5 years. Alternatively, these mobile network operators could adopt 'Rest of the World' tariffs for mobile roamers in the UK. Under such a scenario, the average roaming spend per active mobile roamer would double by the end of 2022 due to higher costs, reaching $150 per annum, compared to our current estimates of $75. The Juniper Research study findings uncovered that while this is a possibility, it is highly unlikely given historical customer backlash to such events and further government regulatory interventions.